Prepare the batter according to the instructions given on the cake mix pack or check here to make home made base cake. Divide the batter into two portions and bake the cake in two baking pans of same size. This is for two layers. Melt the semi sweet chocolate in microwave for one and half minutesÂ or check my chocolate truffles to melt chocolate without using microwave. Boil 1/3 cup of heavy cream, add it to the melted semi sweet chocolate and mix them well. Keep it aside. Make a sugar syrup with a cup of water and add 2 tbsp of sugar. Take the base layer of the cake and sprinkle some sugar syrup. Spread the above mixture as shown in the picture and keep the second layer of the cake on top. Spread the fudge over the cake and decorate it with your own style. I bought the icing cone from the local store and used it for decorating the cake. You can make cones using thick plastic cover and cut the bottom of the cone in different shapes and decorate the cake. 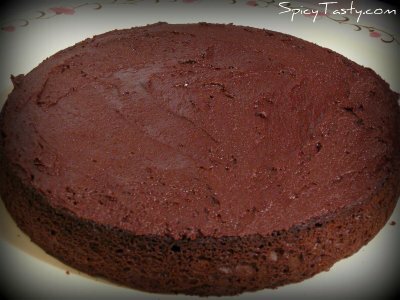 I love love chocolate cakes and this looks beautiful and moist. 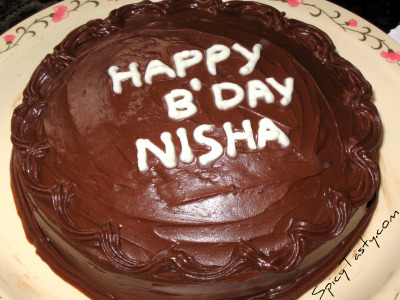 looks sooo delish……love the icing. Hmmm….totally sinful 🙂 Looks so tempting. Your friend is lucky to have friend like you. Hi friends, thank you for your love and comments. 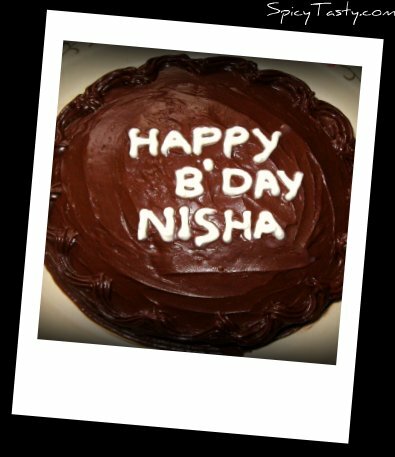 Cake is so Yummy Nithu! !